Approximately 3.8 million people enjoy the sport of parasailing each year, according to Parasail.org. It’s one of the fastest growing adventure sports, available at nearly all of the major coastline tourist areas. There are approximately 240 parasail companies in the United States, with more than 650 boats providing a seagull’s view of sandy shores. Thrilling . . . but how safe is it? The Parasail Safety Council, which has tracked injuries and deaths from the activity, reports that in the U.S. 73 people were killed and at least 1,600 injured between 1982 and 2012. 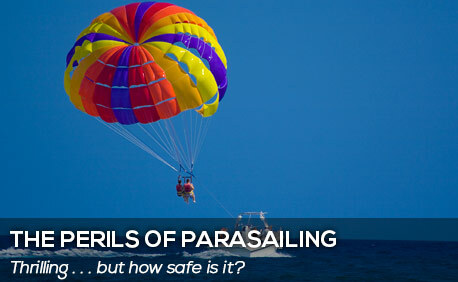 That’s a low accident rate, but when a parasailing mishap does occur, it can be terrifying, with lifelong results. You may recall the horrific accident in Panama City, Florida, in July of 2013 that was caught on video and viewed worldwide. Two teenage girls took a tandem parasail ride that had a tragic end. The tow line to the boat snapped, leaving the pair at the mercy of a gusting wind which slammed them into the 13th floor of a condominium complex and propelled them into power lines before they crashed into cars parked below. Both girls were hospitalized in critical condition in Florida and then were transferred to a facility in Indianapolis for rehabilitation. One girl’s spine was cracked and she sustained brain trauma that has left her with double vision and loss of peripheral vision. Her friend has had three cranial surgeries and extensive spinal surgery since the accident. She lost a large portion of her skull and still struggles with balance, mobility and learning. The wind conditions on the day of the accident far exceeded the safety recommendations on the parasail equipment. The manufacturer’s label on the 39-foot parasail warned that it was not intended for use in winds of more than 12 mph, but on the Coast Guard estimated that on the afternoon of the accident wind speeds were more than 20 mph with gusts of 31 mph. In fact, other parasail operators had ceased operations for the day because of an approaching storm front that was visible on radar and with the naked eye. The boat and winch system, made in 1998, was designed for parasails smaller than the 39-footer used in the accident. Once the winds picked up, the winch was not strong enough to pull the riders back in. • The boat captain did not adhere to recommendations about distance from shore while parasailing. Coast Guard guidelines recommend a minimum of 2,000 feet from shore in wind conditions from 0-10 mph, and 5,000 feet in wind conditions of more than 20 mph. Parasailing companies would have to have at least $1 million in insurance. Parasailing must cease when winds reach a speed of more than 20 mph and when lightning is within 7 miles. Parasail boats would have to have a U.S. Coast Guard license and be equipped with weather radar with real-time forecasts. There would be limitations on parasail canopy size. Canopies, passenger support systems and tow lines would have mandatory replacement dates based on number of flights or age. The family of one of the girls injured in the Panama City accident has filed a lawsuit against the parasail operator (Aquatic Adventures Management Group), its owner and the Treasure Island Resort. It alleges the operators negligently ignored dangerous weather conditions, used unsafe equipment, and were too close to shore. They seek compensation for past medical costs, future medical expenses including surgeries, and loss of companionship. Can any amount of money return these girls to their pre-accident days of carefree living? Of course not. But perhaps it will help provide rehabilitation and therapy that will make the rest of their days a bit easier. That’s the goal of personal injury lawyers, including those at The Louthian Law Firm. If an owner’s or operator’s negligence resulted in an injury to someone in your family, call the Columbia amusement injury attorneys at (803) 454-1200.